The word 候机楼 (Trad. 候機樓) hòujīlóu ‘wait plane building’ took my fancy the very first time I set eyes on it. It was so unmistakably Chinese in form and straightforward in concept. Describing an airport terminal as a waiting building for catching a plane is engaging in its earthiness, suggestive of an era of simple aerodromes where the terminal building was indeed not much more than a waiting room where you sat while your plane taxied in for boarding. The choice of morphemes is also very Chinese. 候 hòu is a fancy expression meaning ‘to wait’. Although in everyday life this would normally be 等 děng, in formal or polite situations 等候 děnghòu or just 候 hòu are more likely to be used. The character 机 (Trad. 機) jī ‘machine’ is short for 飞机 (Trad. 飛機) fēijī, ‘flying machine’, i.e., ‘aeroplane’. 楼 (Trad. 樓) lóu is one of several Chinese terms for a large building. If the Japanese had created a similar word based on such a concept (which seems fairly improbable), I doubt they would have come up with 候機楼 kōkirō, which has an incongruous literary Chinese feel to it. They would, I suspect, have created a word like 待機館 taikikan, from 待つ matsu ‘to wait’, 機 ki for 飛行機 hikōki ‘aeroplane’, and 館 kan, the usual term for large buildings of various descriptions. The character 候 is not normally associated with the meaning ‘wait’ in modern Japanese, and 楼 sounds positively old-fashioned, being used only in expressions like 摩天楼 matenrō ‘skyscraper’, 船尾楼 senbirō ‘sterncastle’, 望楼 bōrō ‘watchtower’ and historically in the names of restaurants, inns, and brothels, etc. Needless to say, a transparent compound like 'wait plane building' easily lends itself to error when translated into English. One such error was pointed out on Weibo in 2013, when a user posted a photo of machine-translated signage from Chengdu showing bus route 300 going from the railway station to the "hou machine building". A couple of things have since shaken me out of my indulgent reverie over this wonderful term. The first was the discovery that when Beijing Capital International Airport reinvented itself as a sparkling new showcase for the 2008 Olympics, the authorities apparently decided that the humble 候机楼 hòujīlóu wasn’t suitable for their modern international airport. It was replaced by the more sophisticated 航站楼 (Trad. 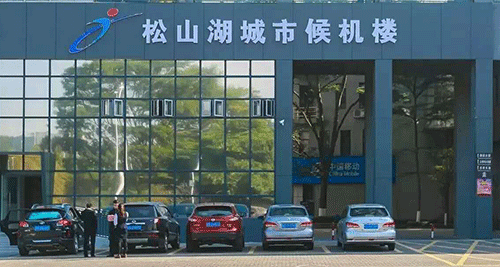 航站樓) hángzhànlóu ‘aviation station building’, which is what road access signage to the airport now uses. (航 háng is short for 航空 hángkōng ‘aviation’, 站 zhàn is the common word for stations, bus stops, etc). In naming their terminals, the Beijing authorities went one further, officially calling them T1, T2, and T3, based on English. In one glorious leap, Terminal One at Beijing Capital International Airport went from “一号候机楼” yīhào hòujīlóu ‘number one wait-plane building’ to “T1″! Of course, most Chinese in everyday speech use the far more utilitarian 一号楼 yīhàolóu ‘number one building’. After a bit of research, it became obvious that 候机楼 hòujīlóu and 航站楼 hángzhànlóu have become competing names for airport terminals in China. Baidu actually has two separate articles on 候机楼 and 航站楼. But 航站楼 hángzhànlóu clearly has the upper hand; airports across China now prefer to call their terminals 航站楼 hángzhànlóu. I had previously seen 候机楼 in airport or road signage in Beijing, Haikou, and Shenzhen Bao'an airport, but it has now virtually disappeared. 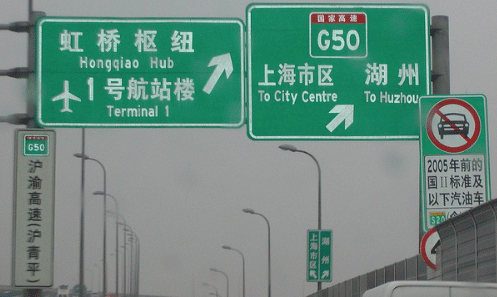 Needless to say, 候机楼 hòujīlóu is still in use and can be found in both spoken and written contexts, but with its disappearance from airport signage it appears to be making a gradual transition from ‘generally preferred term’ to ‘less preferred term’. And as we shall see below, it is undergoing a gradual transfer of meaning. I had always assumed that 候机楼 hòujīlóu applied to airport terminal buildings. My second discovery was in Dongguan, where I found that 候机楼 hòujīlóu was used not only for the airport terminal itself, but also for bus terminals providing services to airports. The photo of another terminal in Dongguan (below) exemplifies the use of 候机楼. In Dongguan, such bus terminals serve both Shenzhen and Guangzhou airports. The literal meaning of ‘wait for plane building’ seems fairly appropriate here, especially as these bus stations can also issue boarding passes to passengers. 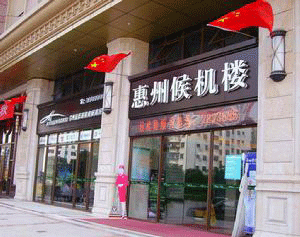 In Huizhou, the same type of 候机楼 hòujīlóu is (or used to be) called ‘Huizhou Check-in’ at its website. The usage of 候机楼 hòujīlóu for such city terminals has now spread nationwide and appears to be on its way to becoming the preferred meaning. From the Internet, it also appears that the term 航站楼 hángzhànlóu can also be applied to such bus stations, e.g. in Shanghai. This usage has parallels overseas. For instance, Tokyo has long had a Tokyo City Air Terminal (T-CAT), which fulfils broader functions like checking in luggage. Having become intrigued by changing usage in China, curiosity led me to check out the situation in Taiwan, mainly using Wikipedia. The Wikipedia article on airport terminals itself gives a number of terms: 航站楼 hángzhànlóu, 航站大厦 hángzhàn dàshà, 候机楼 hòujīlóu, 客运大楼 kèyùn dàlóu, and 航廈 hángshà (Trad. respectively 航站樓, 航站大厦, 候機樓, 客運大樓, 航廈). Of these, Taiwanese airports mainly use 航站樓 (Simp. 航站楼) hángzhànlóu, 航站大廈 hángzhàn dàshà ‘aviation station building’, and the abbreviated form 航廈 hángshà ‘aviation building’ for their terminal buildings. The abbreviated form is the most common term in signage. Interestingly, many smaller Taiwanese airports are officially known as 航空站 hángkōngzhàn ‘aviation station’. It is very likely that this, in contracted form, is the actual origin of the name 航站樓 hángzhànlóu. If that is the case, the currently preferred Chinese name, 航站楼 hángzhànlóu, possibly came from Taiwan. Hong Kong and Macau airports use the term 客運大樓 (Simp. 客运大楼) kèyùn dàlóu ‘passenger transport building’. 客運 (Simp. 客运) kèyùn ‘passenger transport’ is, of course, opposed to 貨運 (Simp. 货运) huòyùn ‘cargo transport’. * In Chinese, native morphemes, generally monosyllables, are used as building blocks to create compound words of relatively transparent meaning. 候机楼 hòujīlóu is an excellent example of this. * Two-morpheme expressions are preferred in Chinese word-building. * Even in cases like this, involving three-character expressions, the structure is actually 2 morphemes + suffix (e.g., 候机 hòu-jī ‘wait plane’ + 楼 lóu ‘building’). And if the etymology of 航站 hángzhàn ‘aviation station’ as an abbreviation of 航空站 hángkōngzhàn ‘aviation station’ is correct, this demonstrates a similar preference for two-syllable forms. * The fact that such words are easily analysed lends itself to a certain fluidity in word-building. The substitution of words for ‘building’ like 大厦 dàshà and 大樓 (Simp. 大楼) dàlóu is an example of this. Similarly, the fluidity of meaning of 'wait-plane building' has facilitated the use of 候机楼 hòujīlóu for city terminals. The stripping down to basic forms like 一号楼 yīhàolóu ‘number one building’ in normal speech is a further illustration of this fluidity. * There is a distinct tendency in Chinese for two terms to exist for the same thing: a ‘fancy’ official term and an everyday one. 航站楼 hángzhànlóu is an obvious example of a preferred official term which is gaining at the expense of an ordinary term. To round this off, here is a quick tour of words for ‘airport terminal’ in East Asia. Station sign at Narita (from Toolbox life log). Note that the station is 空港第２ビル kūkō dai ni biru 'Airport No. 2 Bldg', with 成田第2・第3ターミナル narita dai-ni dai-san tāminaru, meaning 'Narita Terminal 2・3', in parentheses. Korean uses 공항 터미널 gonghang teomineol ‘airport terminal’ (gonghang=空港). Interestingly, even city airport terminals are known as 터미널 teomineol in Korean, and translated into Chinese as 城市航站楼 chéngshì hángzhàn-lóu. Sign for railway station (from BAYPAX 韓国旅行). 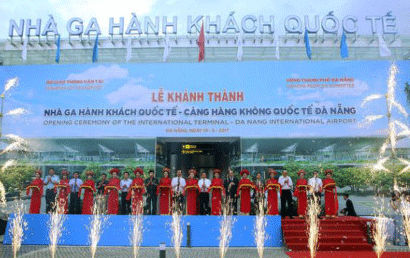 Vietnamese uses (nhà) ga hàng không ‘aviation station’, where ga is from French gare ‘station’, and hàng không ‘aviation’ is related to Chinese 航空 hángkōng. Nhà (literally ‘house’) is used for buildings in Vietnamese. Also found is nhà ga sân bay 'plane terminal', where sân bay is a native word for 'aeroplane'. The word for airport is Cảng hàng không, where cảng means 'port' (related to Chinese 港 gǎng 'port'). Tan-Son-Nhat airport terminal uses ga hàng không (from INTOC). Da Nang international passenger terminal opening ceremony. Name uses nhà ga hàng. (Khách = 'passenger'). From Báo Mới). Mongolian appears to use Нисэх буудлын барилга nisekh buudlin barilag (or Онгоцны буудлын барилга ongotsni buudlin barilag), which simply means ‘airport building’. Since there are no airports in Mongolia with multiple terminals, this is a very straightforward and commonsense usage.